E-Motion merges active mobility with therapeutic benefit, enabling wheelchair users with impaired strength to move around independently and more easily. Only minimal force is required to self propel the chair and the user‘s active range is increased making it easier to negotiate hills and ramps etc without assistance. E-Motion fits most of the modern wheelchairs normally available on the market. 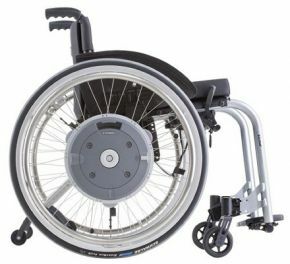 The chair‘s original wheels can simply be exchanged for e-motion drive wheels giving the user the choice of manual or powered assisted wheels. E-Motion can be switched on and off from an upright sitting position using the remote control. In addition, two selectable power stages assure optimal driving convenience – precisely adapted to each user’s personal mobility restriction and needs. Wheelchair users will also appreciate the rollback delay, which prevents the chair from rolling backwards down a slope and is an invaluable aid on steep hills. The high-contrast display shows the battery charge as well as various service and diagnostic codes. Thanks to the large buttons, all functions can be easily accessed even with restricted hand function. Numerous parameters, such as the assistance level can be freely programmed. convenience and easy of transportation. You benefit from a significantly extended active range that adds to the enjoyment of outings or holidays. The E-Motion wheels and their integrated batteries can be detached from the wheelchair and stowed away in the boot of a car in a matter of seconds. Alternatively, any folding wheelchair can still be folded even with E-Motion attached, thus saving space. The battery charger supplied with E-Motion adapts automatically to any mains voltage from 100 to 240 V – an immense advantage for all those who like to travel. If part of the journey involves flying, the batteries can also be disconnected from the wheel and carried separately. E.motion reduces manual effort up to 80%. Simply use as a manual wheelchair and when applying pressure to the push-rims it engages the power-assist motors to help you with your everyday travels. Can E-Motion be fitted to my wheelchair? E-Motion can be fitted to almost all modern wheelchair models. A bracket is mounted on the wheelchair frame to accept the e-motion wheels. The manual wheelchair wheels can still be used. Which E-Motion versions are available? Wheel sizes: 22" or 24". Push rims: stainless steel. Tyres: pneumatic tyres (standard) or puncture-proof tyres. What accessories are available for E-Motion? Anti-Tippers, spoke covers, rubber-coated push rims, remote control holder, replacement battery pack, push rim covers. How far can I travel on a single battery charge? The drive engineering employed in E-Motion means that the achievable range depends very heavily on how it is used. Indoor movement involving continuous use of motor power for starting, steering and braking reduces the range considerably more than consistent movement outdoors. A battery charge can be sufficient here for a distance of approximately 25 km / 15 miles under favourable conditions. Charging time approximately 6 hours. e-motion does not have a definite maximum speed level. The speed achieved depends on the strength of the propelling movement, as is the case with manual wheelchairs. E-Motion assists the propelling movement up to 6 km/h / 3.7 mph. How heavy may a person using e-motion be? E-Motion is designed for a maximum person weight of 130 kg / 20 stone, regardless of the type of wheelchair used. How much does E-Motion weigh? and how much wider does my chair become? 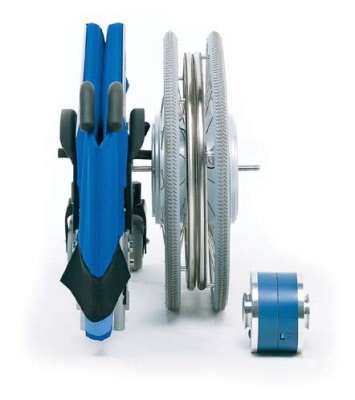 The e-motion power-assisted wheel is mounted on the wheelchair in place of the manual wheel. The batteries are integrated in the wheel hub. A sensor registers the propelling movement and activates the electrical motors. The wheels are fantastic, I suffer with a connective tissue illness that affects my core strength, to have the wheels is truly fantastic as they reduce the effort needed to push a wheelchair by at least 60% but, it\'s up at 80% at times. I noticed Nigel was up to date with the products giving me expert advice and instantly felt confident placing my order with him rather than someone more local who had the \"it\'s business attitude\". The fitting off the wheels was also included with Nigel where as others wanted to charge more on top. When purchasing a really expensive item you want to feel confident that the people selling them know the product and can support you through the purchase and after care, I don\'t expect any issues however, I know I will have compassionate and quick support should one arise. I just wanted to say a massive thank you!! For your help with getting the E Motions so swiftly. It really did make Jack’s Easter. Can you please thank the technician as well? Will be recommending you again.